The last time I was in London, I came this close to buying a vintage silk scarf emblazoned with the image of a snarling poodle. Priced at over $300 in U.S. dollars, I couldn't justify the cost. I said, "I love that someone thought a rabid dog was an appropriate design for a luxury textile, but when I fold it around my neck, no one will be able to see the bonkers picture." The ever-helpful shop clerk responded, "But you'll know the picture is there. And that's what counts." I wish I had bought that scarf, because it would look perfect, framed as art over my desk. There are so many ways I could have turned the scarf into my own dog fashion show. Or fashion dog show. You get what I'm saying. 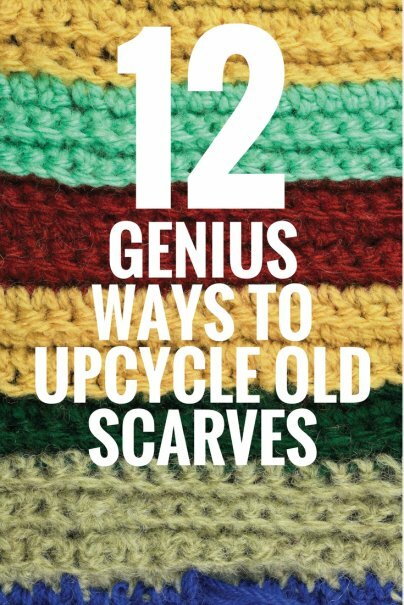 But if you have scarves sitting in your closet that you have no idea what to do with, upcycle them with any of the ideas below and give them new life. Fashion houses like Hermes and Ferragamo that are known for their silk scarves often partner with famous artists to create scarf designs. Museum shops will even replicate their most important works in their collections as scarves. Although I will never be able to afford an original painting by David Hockney or Antonio Dias, a framed scarf offers me a chance to own a favorite image on a unique medium. But framed scarves need not be expensive or rare. You can use your own scarves to create a beautiful decor piece and give a drab wall a fresh look. My friend Jane used pieces of vintage silk saris as table runners at her wedding, but a similar look could be achieved with long scarves. If you are worried about getting stains on your scarf, consider putting your scarf under a glass tabletop. Scarves are also great way to hide the wear and tear on the tops of vintage wood furniture like side tables and dressers. After the wedding, my friend Jane upcycled the saris, again, this time from table runners into a duvet cover and coordinating curtains for her home. A collection of scarves can be turned into a dramatic room divider with very basic sewing skills. Or create glamorous custom cushions by sewing scarves into pillow shams. Furoshiki are traditional wrapping cloths used to create custom bundles to transport clothes, gifts, and hard-to-wrap goods. There are dozens of ways to fold scarves into carrying cases for everything from books to bottles. Simply fold your scarves on the diagonal, tie together, and hang. Voilà! Instant bohemian style. Take your boho bunting-making one step beyond by tacking scarves to your ceiling. It also adds a cozy feel to a reading nook. You know who else has a tiny wardrobe? Pregnant ladies. Luckily, scarves are a one size fits most accessory. For all of you moms-to-be, here are the instructions on how to make your own nursing cover. For the mothers of winter babies, use a blanket scarf to cover up fashionably. Turn your favorite bracelet into a necklace by adding a scarf. Or finally show off that family ring you inherited that won't fit your finger by using it as a charm. Add a scarf to a buckle to create a belt or a bracelet. Or you can convert a kerchief into a watchband. Wear a scarf as belt to perk up basic clothes. Or, fold a long scarf into a cummerbund. The vintage dresses and coats that I buy are often missing their original belts, but traditional silk scarves are timeless enough to coordinate with most 20th century fashions. Add some new flair to your go-to bag with a scarf you rarely use. You can also make your luggage easier to identify by adding a small scarf or handkerchief to the strap or handle. Frida Kahlo is really underrated as an icon of timeless style. Frida actually had two different versions of her famous flower crown updo: one where she braids a scarf into her hair from the back, and one where she braids the scarf into her hair from the top. Depending on the length or your hair and your hair styling ability, one might be easier to achieve than the other.